There are literally dozens of versions of the Bible. There are some that simplify the old-style English into everyday speech and some even go a step further and translate it into “hip-hop” lingo. Each verse of this very straightforward version of scripture is accompanied by a picture — made entirely of Legos. I would not recommend this book to anyone who can’t see the humor in the holy books. 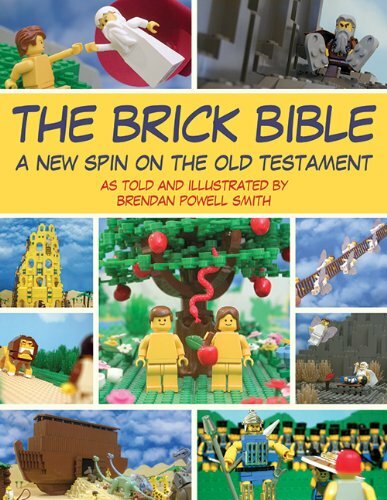 While most of the humor in “The Brick Bible” comes from the simple fact that the Israelites and Canaanites all have happy yellow faces and blocky bodies, some extra giggles come from the occasional commentary that the author puts into the pictures. He doesn’t pass his opinions off as scripture, mind you — he types his quips in grey instead of black. Just about any survey will tell you that most Christians have never read the Bible from start to finish. If this book gets people to read it, who can complain? While this would make the ultimate coffee table book, it is still full of blood and sexuality, like the traditional Bible. The blood is all made of red bricks and the Lego people don’t have reproductive organs, but still. While the King James Bible is certainly not for children, I’d say “The Brick Bible” is more PG-13. There’s no excuse not to have “The Brick Bible” in your home. In fact, throw away whatever bibles you have when you get it. Trust me, you won’t read them again. Christian, Jewish, Hindu, Atheist, or Pagan, you’re bound to get a kick out of this book.